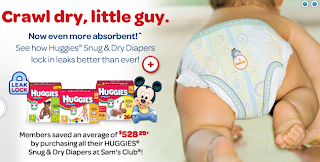 Did you grab one of these free Huggies Snug & Dry diapers from Sam's Club yet? You don't have to be a member for this one! Sizes 3 - 6 available. One sample per household and you must be 18 years of age. Sorry about that! Usually when the membership number space is not starred, that means it is not required.